Ashelyn Vienna, 6.4 6.3 lbs, born March 30 at 7:50AM. At home, because we never made it to the hospital. And our midwife didn’t make it to us. And Kevin, who has said all along that he wanted to remain on the “head” side of the birthing action, had to help catch the baby. Hopefully that story will be up soon. The middle-of-the-night bathroom runs are back. Just one or two a night, so it’s not too bad. Except this morning, shortly after 6AM, I think I passed my mucous plug. Kevin paged the midwife on call, who assured us that everything was probably fine, but I might go into labour this weekend. We haven’t installed the carseat and I haven’t finished packing the hospital bag and we still haven’t found a family doctor and the floors need to be swiffered AAGH. Then again, who knows? It might not happen this weekend. 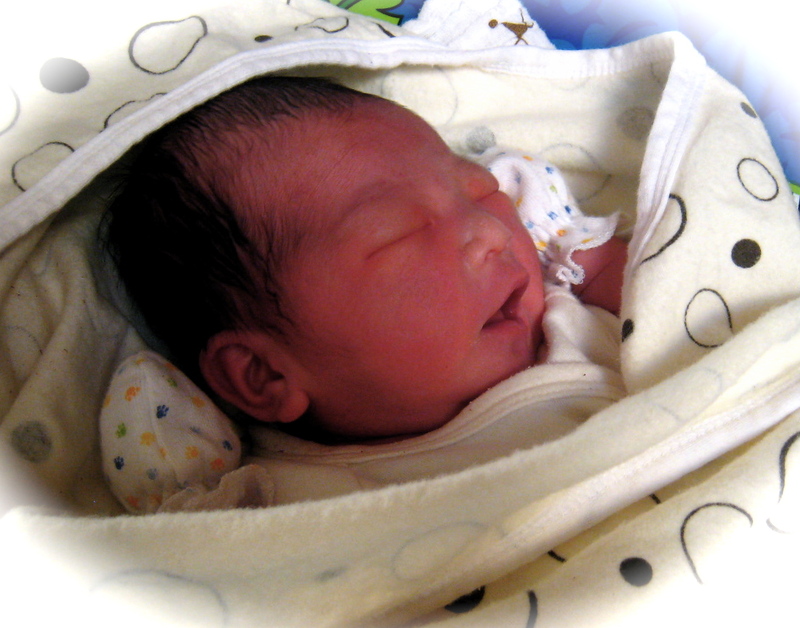 At our last appointment, my midwife estimated munchkin’s weight to be around six pounds. That sounds manageable. 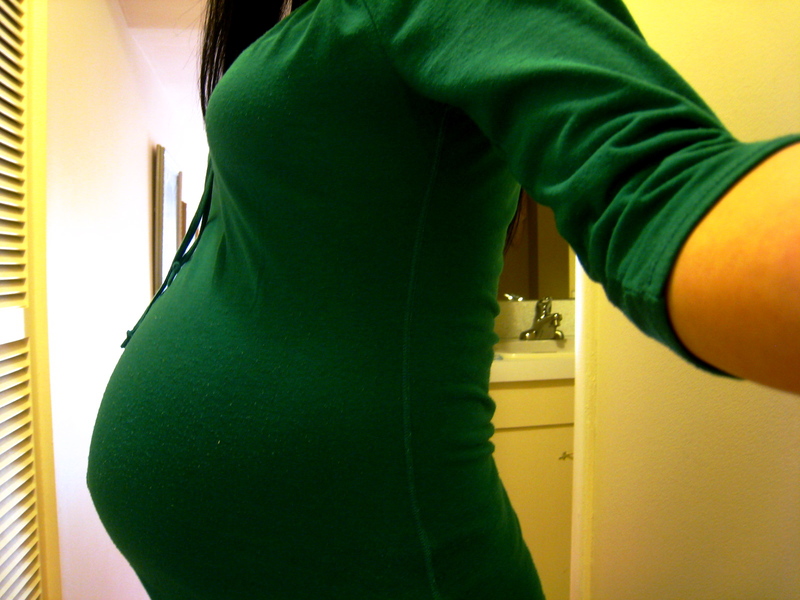 If I carry to 40 weeks, munchkin will likely be in the sixes or low sevens. Footnote: I’ve barely gained 25 pounds this pregnancy. I’m glad I made it past the weekend, because we were way out in the suburbs and it would’ve been a looong drive to the hospital. And I forgot to bring my CareCard. Also, my baby shower was Sunday night. Now to see if I’ll make it past this coming weekend. I hope so, because I have a dinner on Wednesday and another on Sunday. My mom said she tended to deliver a week early, but then pointed out that she was much more deliberate about being active and getting exercise during pregnancy than I’ve been. Heh. I think most women are so over being pregnant by this point … but then “most women” seem to suffer ten times the symptoms I do. Although it’d be awesome to sleep on my stomach again. And to have my belly button look normal. AND TO GO SNOWBOARDING. But s/he’d better not come yet, because I am so NOT READY. Just … stay in there until Easter long weekend, alright? At least give me the remainder of March to tie up loose ends. I’ve been having braxton-hicks contractions all day. They don’t hurt, but when they happen my belly bunches up all lopsided, because munchkin has been hanging out on my right side all pregnancy. Our baby stuff is scattered around the house. Actually, there’s not that much baby stuff. People think babies are expensive, that you need to afford to have kids, but that’s only if you fall for all the marketing gimmicks. Especially the ones that play off the insecurities of first-time mothers. Here’s the glider in the living room. 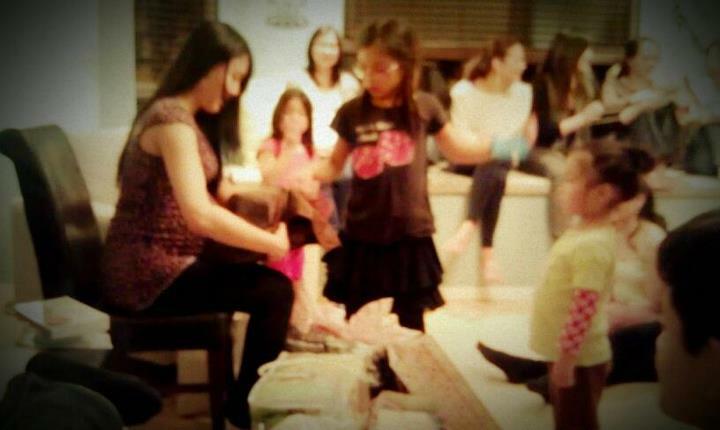 At one point we had four baby swings/rockers/vibrating bouncy chairs. My favourite is the Bright Starts InGenuity portable swing we picked up from the hand-me-down exchange corner of my midwifery clinic. I love that corner. And they should make adult versions of these things. We might keep another rocker on standby for a while, in case munchkin is contrary and decides to hate this one. (S/he was contrary enough to be uncooperative at the big twenty-week ultrasound, after all.) 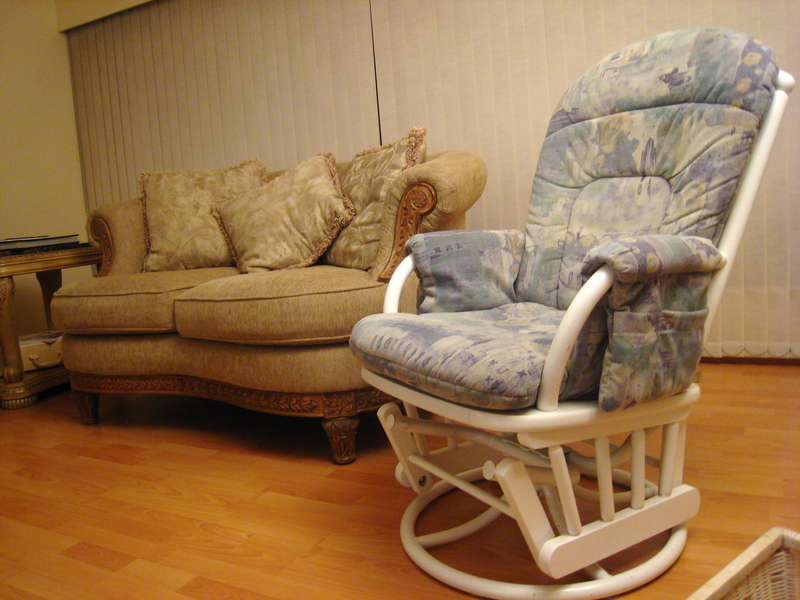 The rocker came with a ring sling and the above change table, another Craigslist find at $20. If we weren’t planning to cloth diaper, we might not have bothered with a change table, but I figured a change station of sorts would be easier with cloth. Once we have a diaper pail I’ll move the swing elsewhere. I didn’t consider a stroller to be particularly essential, but a colleague of Kevin’s very kindly passed down her Graco Mosaic travel system to us. After fussing with it endlessly, because that thing is quite nifty, I’ve parked it in a corner of our dining area. She also gave us a newborn-to-toddler bathtub. Speaking of tubs, my friend had her baby last October, and during his first bath she accidentally dropped her husband’s new iPhone 4S into the water. 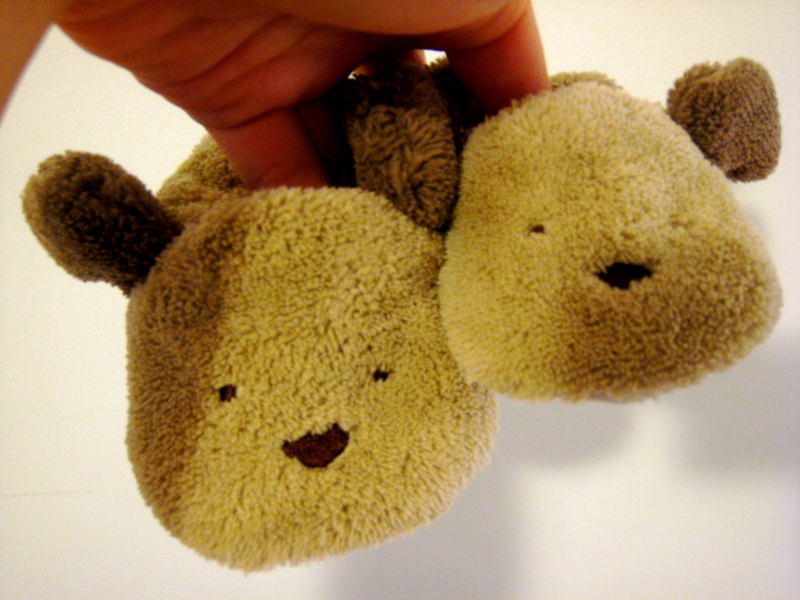 I’m probably on record for wondering why baby shoes even exist, but then I came across these. For 99 cents. And I succumbed. Some time later, one mother informed me that baby shoes are for keeping their socks on. I feel sufficiently justified. These, and the rest of munchkin’s squee-inducing wardrobe are in an old dresser in the guest room that never became a nursery. 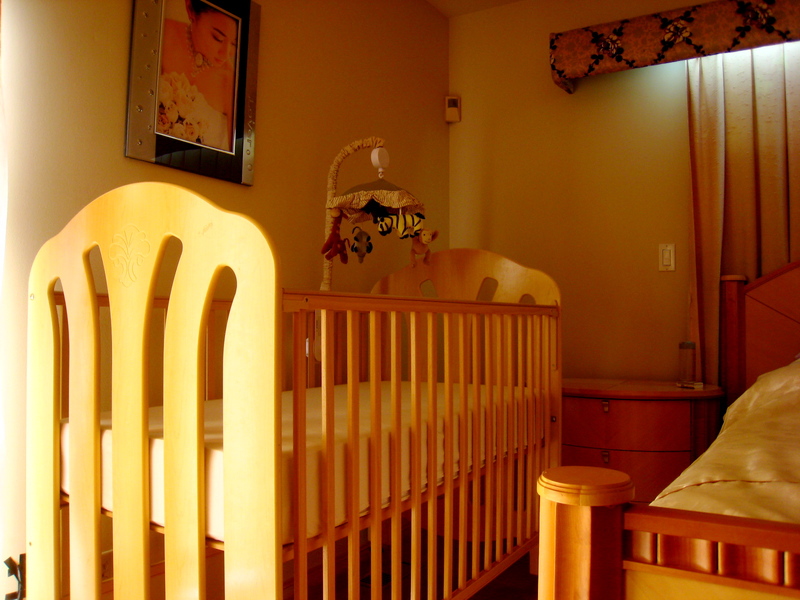 I like the idea of a nursery, but I’m not sure how practical it would be for us to have everything in a single small room in one corner of the house. Chances are, not very. I’ve been called both big AND tiny for my gestational age. I’ve had a persistent unsatisfied craving for ice cream, preferably of the McDonald’s or DQ variety. I am morbidly curious about other people’s labour stories. 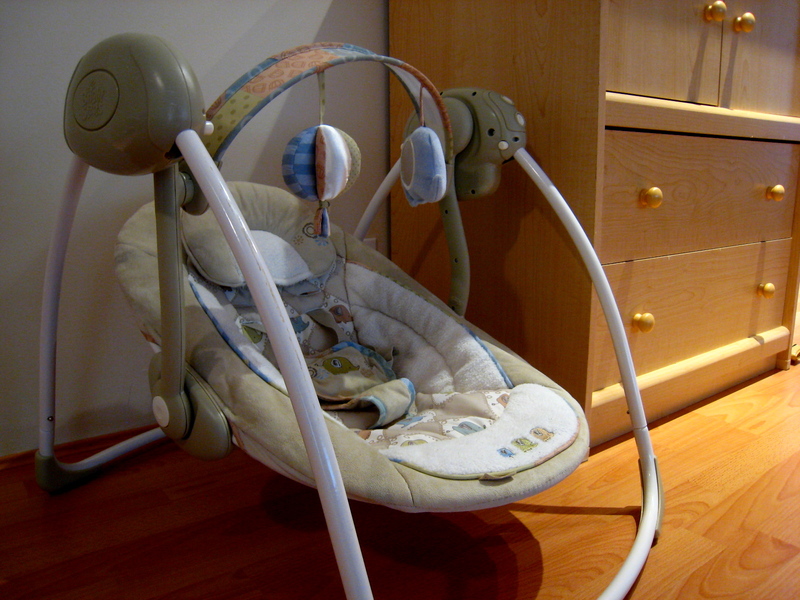 It’s a Storkcraft ELISA, manufactured in 2002. We’ve already installed the new mattress support brackets, and the dropside immobilizers just need to be plopped into place. 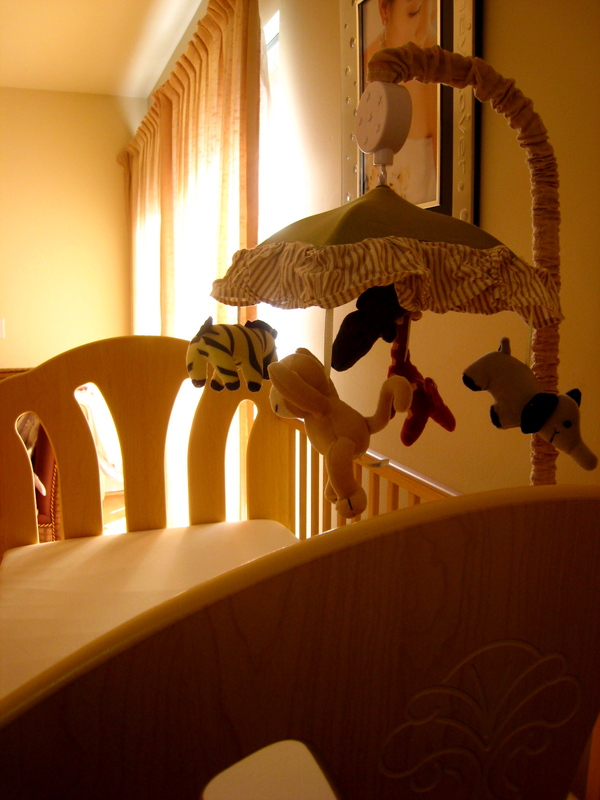 The crib was in excellent condition otherwise … even the old support brackets, which were recalled because there was a possibility of breakage when installed incorrectly. As it is, I’m more concerned about that wedding picture falling off the wall onto the baby than I am about the crib malfunctioning. OMG in another month or so THERE WILL BE A BABY in that crib.